I learn something from every component I evaluate. Mostly this learning takes the form of discovering—or rediscovering—an aspect of music reproduction that I realize I’ve been missing. With the Omen Dirty Weekend loudspeaker from Zu Audio (Ogden, Utah), I rediscovered several things that I had drifted away from in the last few years of assembling a home system. Given that this model from Zu costs less than $1,000, it’s fair to say this rediscovery experience came as a pretty big surprise. Zu’s rooms at regional audio shows have been must-see for me for many years. The appeal has been less about the sound in the Zu rooms than about the musical experience. Sean Casey, Zu’s founder and president, generally runs the demos himself, which tend to feature LP playback exclusively. Sean has wonderful taste in music (or whoever curates his demo music does). His taste leans toward indie material in rock and related genres, so you hear less classical and less traditional jazz in the Zu room than in most rooms at an audio show. You also hear little or none of the standard audiophile fare. What I hear in Zu rooms is a lot of music I’ve not heard before, which is no surprise given that Sean is a generation or so younger than me. But it’s not about the music being new, it’s about it being compellingly interesting. I get engaged, I stick around, I turn on Shazam on my phone because I know I’m going to hear things I’ll want to look for after the show. As to the sound itself, the Zu rooms have been a mixed bag for me over the years. Sometimes they sound very good from a traditional audiophile perspective. And sometimes they don’t. If you poke your head in the door and listen, you may be put off. Then again, that can be said of many rooms at audio shows. But if you stay for a bit, you may start to like what you hear. This is a curious thing, I think. I rarely love the sound of someone else’s system the first time I hear it. Sometimes that impression never changes, but other times, after a second or third visit, things start to click. There’s a high-level question here, which is this: if a system does a good job of reproducing music, why isn’t that immediately obvious? Sometimes it is, but often it’s not. 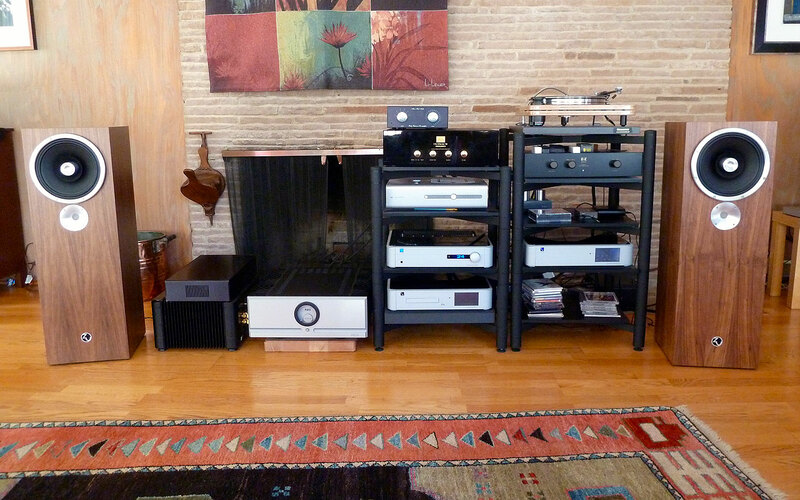 In any case, the Zu sound is different from that of the mainstream high end. 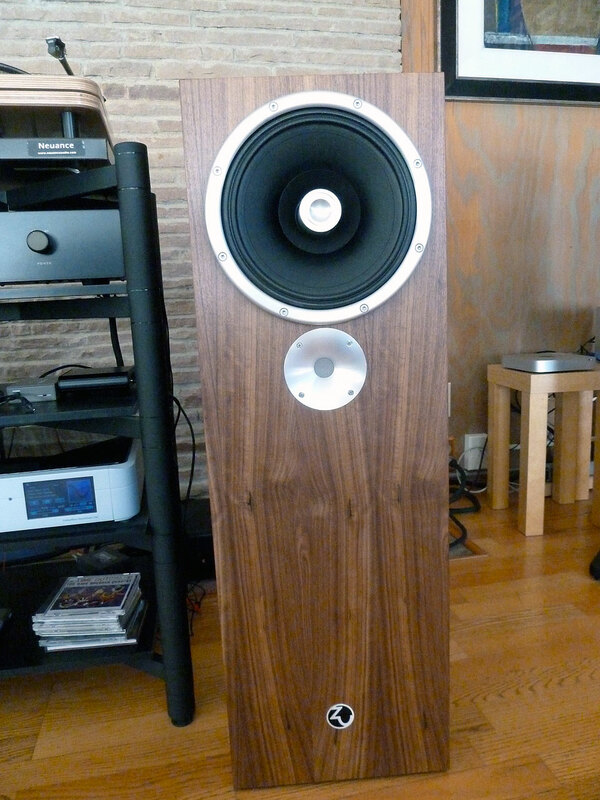 Zu speakers are built around a 10” full-range driver (or two) supplemented in the top octave by a tweeter. Their designs are focused on the human voice first and foremost. The Zu sound doesn’t have the ultra resolution and neutrality of a Magico or other brands in that class. Nor does it have the glorious midrange and warmth of, say, Harbeth. Soundstaging is not spectacular and the tone rarely fools you into thinking you are hearing the real thing, though you are often moved as if hearing real music. Of course, not everyone likes the above-named brands anyway. And audio shows always have a few rooms featuring large horn speakers, often made from vintage components. These usually sound outside of the mainstream to me, and usually they sound not quite right. But many people love these horns, as I might if I lived with a pair for a while and came to discover their virtues. There are also mainstream speakers that never seem to work for me, such as Martin-Logans, which sound overly bright and brittle to my ears. While the Zu sound is different from the mainstream, so is the company. Zu’s products, manufacturing, distribution and general ethos reflect a clear and consistent vision of what they want to do and who they want to be. Spend a few minutes on their website and you will see that they have a point of view, a mission that they have stayed true to for the nearly 20 years of the company’s existence. A word that comes to mind is unvarnished. They seem to go out of their way to avoid traditional marketing-speak, yet they speak with a voice that is both clear and true to who they are. They’re different, but refreshing. At the 2017 California Audio Show, where I spent three full days, I was in the Zu room more than anywhere else. And I say that fully acknowledging how much I enjoyed the rooms by Audio Federation (Acapella), Von Schweikert/VAC/Eigen Audio, Sound Lab, Audio Note, Volti Audio and others. Zu was showing the new Druid Mk VI, which had not yet been released at the time of the show. 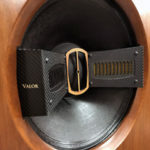 It was the best sound I had heard from a Zu speaker but, again, there was that musically compelling thing going on and it was going on in spades. I was thoroughly enchanted by what I was hearing. Zu sometimes has models in stock, but when I placed my order the Omen Dirty Weekends were built to order, so I waited for a number of weeks to get my pair. I don’t remember what happened audio-wise in the interim, but it left me unsure about even trying the Omens. They sat unopened in their boxes in my foyer for weeks while I vacillated about whether to unbox them (Zu has a 60-day return privilege, no restocking fee, they pay shipping). I vacillate a lot, especially in this hobby. And while I suppose nothing in audio is more important or desirable to evaluate at home than speakers, and there are plenty I would love to hear at home, speakers generally require more effort and, let’s say, commitment than other components. I enjoy putting new electronics in the system, but speakers are daunting. Nevertheless, I got inspired one afternoon and set them up, and I am glad I did. The Omen Dirty Weekend (Omen DW) is effectively a reduced-cost Omen Mk II. Both are two-way floorstanding speakers of modest dimensions (36” tall with a 12” by 12” footprint, 54 pounds). They present a 12-ohm load with efficiency claimed as 97 dB and a bandwidth of 35 Hz – 22k Hz. The Omen DW uses the same drivers as the Omen Mk II, which are Zu’s zu260frd/nd 260 mm nanotech/paper composite full-range driver and the Zu/ASD:1001 tweeter assembly. Both use the Zu-Griewe box/acoustic loading technology. Zu uses more advanced and expensive drivers higher up its product line. 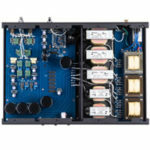 The cost reductions achieved for Omen DW relative to the Omen Mk II come from parts substitutions in internal wiring, crossover capacitors, and speaker terminals (the Omen DW does not include the Zu-B3 input connector). Like all of Zu’s speakers, the Omen DWs have a slightly pro audio look, which appeals to me visually but is a bit plain and utilitarian. The speakers are well made where it counts but they are not fancy-looking speakers-as-furniture. Zu breaks in the Omen DWs for 300 hours before they ship. (The company’s higher-priced models get 600 hours of factory break-in.) My pair sounded good to me from the get-go; if they improved over the subsequent weeks, it was minimally. They sounded, in fact, surprisingly good from the start. Some brightness in the early listening was no longer noticeable. My initial response to the Omen DW was a pleasant surprise at how basically “right” they sounded in my room. This included sounding neither forward nor recessed; having good bass weight even at low volume; a treble with sufficient sparkle and openness, again even at low volume; a lively and engaging sound; and they sounded like music. If the Omen DWs were not exactly like the other speakers I had in house, there was not a single moment of ‘uh-oh, these aren’t going to work,’ which is a place I’ve found myself before. My room, which is our living room, measures 16’ x 23’ and I have the speakers on the long wall. There is a wall of glass covered by vertical blinds behind the listening position and the ceiling slopes from 11’ above the front wall to 9’ behind the listening position. I’m not using any room treatments at the moment. It’s not ideal, but it’s what I’ve got. I never seem to get as much bass weight as I want in my room, even with speakers that aspire to be more full range than the Omen DWs. The perception of bass weight doesn’t necessarily come from deep bass, however. One thing I never get in my room is bass boom. (Secretly, I wish I could experience it, just for a little while. I’ve put it on my bucket list.) But the Zu bass was there for me and it had the kind of taut tunefulness I favor. I have tended to prefer sealed-box designs over the years. Zu describes the Omen DW as “a turn-it-up, hell-on-wheels demon, but it serves up oodles of detail at hushed, late-night levels.” I can confirm both parts of that statement. I listen mostly at lower levels. The first realization or ‘learning’ I got from the Zu Omen DWs concerns transparency to the source, which I will define here as how well the speakers reveal system changes ahead of them. This was not a new finding for me but rather a useful new perspective. Over the years, I have danced with this aspect of audio, stepping back and forth between speakers that reveal a lot and those that make everything listenable. It’s neither as black and white nor as either-or as that, of course, but it has been an underlying tension in my audio journey. When I had Quad ESL57 for many years, every change I made was not just noticeable but was like finding myself suddenly on a different planet. The differences between recordings were similarly dramatic. Much of the motivation for journeying away from the Quads was to get greater enjoyment of more of the music I love. The results have been mixed, as many an ex-Quads owner will tell you. But lately, I’ve not been noticing nearly the differences between components or recordings that I’m used to. Part of this is my older ears, no doubt about it. I’m not saying the Zus are Quads, but with them in the system, I have been hearing more dramatic differences when I change amps or cables than I have been noticing for quite a while. Likewise for recordings. But here’s the kicker: I’m getting this without sacrificing any musical enjoyment. Early on in my use of the Omen DWs, I wanted a bit more warmth and body, so I hooked them up the Audio Note Oto SE Signature integrated, which is a 10wpc Class A design using EL84 power tubes. Like a chameleon, the Omen DWs became warmer with more depth and body to images; their character changed considerably but not completely. Ultimately I returned to the Pass Labs XA30.8, which I find irresistible and which, incidentally, Sean Casey has been using as his demo amp. 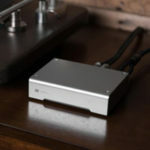 Sonically, the Pass is the best amplifier I have had in my system. Dynamics is a core sonic value of Zu Audio, and it shows. While the Omen DWs are the most efficient speaker I recall ever having in my home, I am reluctant to ascribe their dynamics to efficiency, though it seems likely there’s something to it. What I notice is mainly what I’ve always thought of as microdynamics, that is, the shadings and shifts of emphasis, subtle and otherwise, you hear in a recording, rather than the macro-level swells. Think of the leading edge of a trumpet blast, a drumstick strike on the edge of the drum, etc. These are highlighted with the Omen DWs. The sound is punchy, which has the effect of making music more exciting. High-energy jazz, such as Harry “Sweets” Edison, Eddie “Lockjaw” Davis With Kenny Drew & John Darvilles Quartet ‎– In Copenhagen (MFSL Gold CD) is positively gripping. Whether this excitement is faithful to the event or reflects a frequency response aberration that causes snare drums to jump out a bit, I can’t say, but it contributes to the Zu’s musical success and it did not ever in my evaluation become a distraction. Another core value of the Zu design – their stated central value – is the vocal range. 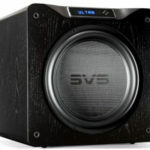 Speakers that employ full-range drivers, or that at least keep crossovers well out of the core vocal range, have potential to deliver a continuous, coherent sound on vocals that more-traditional designs have to work much harder to achieve. I hear this success with the Omen DWs. Voices sound pure, open and stable. A fairly recent discovery is Joan Shelly, a singer-songwriter from Louisville. Her recordings are simple and straightforward, her songs direct and honest. I’d use unvarnished (again) to describe Joan Shelly, and she sounds terrific through the Zu speakers. Also, I enjoy choral music but often find it hard to listen to because of what I hear as a breakup or discontinuity in the sound. With the Omen DWs, I’m not getting any of that and I expect the lack of a crossover in the vocal range is at least a contributing factor. Like many speakers, the Zu Omen DW does detail very well. Maybe not the details that make for killer soundstaging, but the musical details – or what I think of as instrument definition – that help make music engaging. At volume low or high, with the Omen DWs it’s exceptionally easy to follow the musical line, to hear what the musical big picture is and what each performer is doing and contributing to it. This is an essential piece of what I think of as musical; musical is not a kind of sound you hear but a way you experience the music. Jonathan Wilson’s album Gentle Spirit and Lost In The Dream by The War on Drugs are two of my favorite rock releases from the past few years. Neither is exactly audiophile stuff and both feature dense sonics that can sound hazy and confused. Not through the Zu Omen Dirty Weekends, which unravel the confusion and present these recordings in a thrilling and highly accessible way. Though it’s not a requirement to be a music lover, I think most audiophiles are. They are also lovers of sound, otherwise why bother? I love music but I unabashedly embrace my enjoyment of the sensual experience of sound. Solo cello. Saxophone. Percussion: marimbas, tabla, and the Hang (drum), which, sound-wise, is a Brundlefly of tabla and steel drum. Here the Omen DWs do an acceptable job but their tonal capabilities, color in particular, are not up there with the best of other designs. They don’t deliver the spooky verisimilitude, the breath of life you sometimes get that makes you want to luxuriate in the sound. This quality of refined tone is critical for classical music, I believe. There is little or no mention of classical music on Zu’s website – it’s not their thing. And while I don’t think a listener who favors mainly classical would choose a Zu loudspeaker, I was surprised by how satisfying the genre was through these speakers. True, the tonal beauty was lacking, but the qualities of the Omen DWs that make them musical and rewarding for jazz, Americana, and rock also shine through with classical music. Bringing this to a close, I think perhaps the most important insight I got from these Zu speakers was about reassessing the balance between music enjoyment and sonic priorities. Over my many years doing audio, I’ve felt that my highest priority is truth of tone. I want that spooky quality, that refinement, that can fool me into thinking I am in the presence of the real thing. Despite this, over several months of listening to the Omen Dirty Weekends I was never itching to swap them out of the system. I was aware of their shortcomings but never bothered by them, which is not the way it usually goes for me. I continued to enjoy my music with a delighted, often giddy enthusiasm that comes from fresh discovery. Honestly, I think I could live with these indefinitely and be very happy. I know better than to say such a thing, but it’s how I have felt. Naturally, I’m curious about other models in the Zu lineup. In addition to the 60-day return privilege, Zu offers a one-year full-value trade-up. Very nice! I own a pair of ZU Omen Def Mk II’s. Paired with a Leben CS-300F integrated, I get musical magic like I’ve never had in 40+ years of audiophile life. Great review, coming from an Omen DW owner myself. My experience echoes Dan’s almost to a T.
I demoed many models from Zu and finally bought a pair of Omen Def Mk1B – the highest I could afford. Could have chosen another good brand at that price, but I simply love the Zu sound paired with low powered tubes (so far I had a Cayin MT45 Mk2, a Line Magnetic 219ia and a Kingko Audio feedind my speakers). As many will agree, it’s not the most refined, neutral and detailed speaker, but everything sounds amazingly engaging through the Zus!